This content is directed toward an audience of legal drinking age. Did you ever notice road trips nearly always take on a theme. Sometimes it’s planned and intentional. On others, the theme develops organically early in the trip and weaves its way throughout. As 50 Campfires planned Field Trip: Death Valley, the opportunity arose to partner with Ballast Point Brewing Company, and name an “official” beer of the trip. 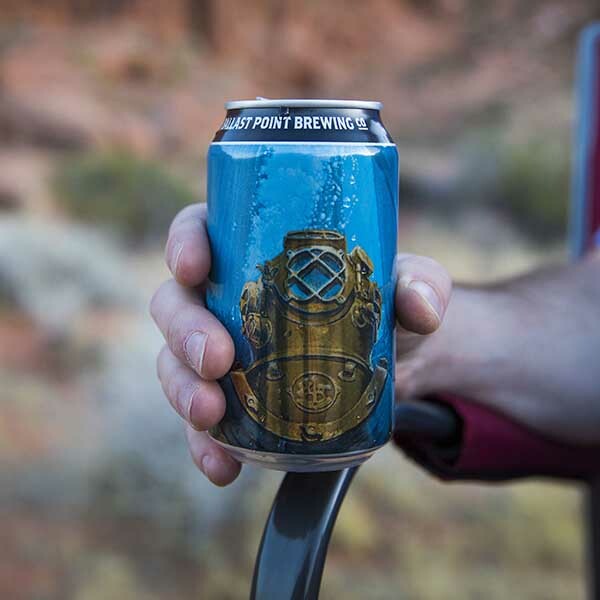 For those of you familiar with Ballast Point beers, that might seem an unusual connection – after all, all of Ballast Point’s brews are connected to the sea and nautical nostalgia. But when you notice the 50 Campfires Field Trip: Death Valley itinerary included Bad Water Basin – the lowest point in the northwestern hemisphere – a beer called Fathom IPA, in cans, prominently depicting an old school hard helmet deep sea diver actually fits right in! It most certainly did with its refreshing flavor and its easy-drinking-anywhere attitude. 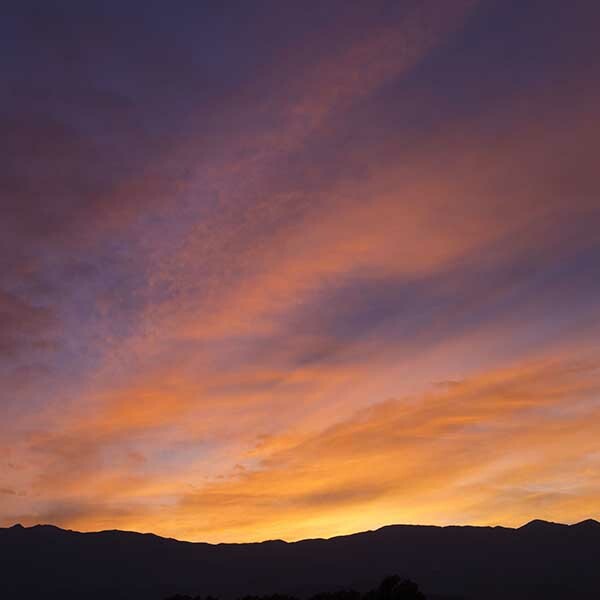 Fathom IPA goes great with 50 Campfires Camping Recipes from the Desert including Dutch Oven Cactus Casserole, Pinyon Nuts & Sun-Dried Tomato Pasta, Savory Mesquite Muffins, and Prickly Pear Cactus Salad. 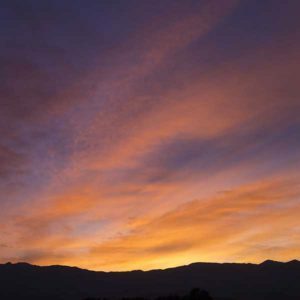 But best of all, Fathom IPA goes with sitting back and marveling at the color and character of a Mojave Desert Sunset! Pass another, please. 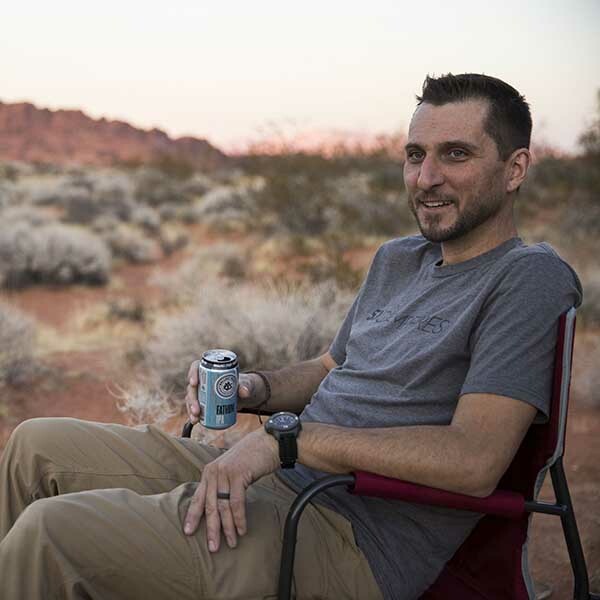 50 Campfires caught up with James Murray, VP of Brewing at Ballast Point, and learned more about the company, and the launch of Fathom IPA. 50 Campfires: What is the origin of Ballast Point’s connection with the ocean and all things nautical? 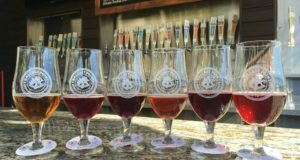 James: Ballast Point started in San Diego, so naturally we love the wildlife and activities that the Pacific Ocean has to offer. We’re also named after a local peninsula with a lighthouse, so our nautical and fishing theme is a nod to our hometown roots and adventurous spirit. 50 Campfires: Last time we talked, Sculpin IPA held the title as Ballast Point’s flagship brew. As another IPA, what makes the new Fathom different? James: Our award-winning Sculpin IPA remains our flagship brew. Fans will be happy to know that while brewing Fathom IPA, we took the same dedication to the craft that produced Sculpin. Fathom IPA highlights what we love about West Coast-style IPAs – including that hoppiness beer drinkers love – but it has less of a hop “bite” and a lower ABV. It’s a crisp-and-clean brew that features a touch of malt on the surface with zesty orange and piney hops below. The result is a refreshing, easy-drinking IPA that has just the right amount of depth. 50 Campfires: Obviously, we’re outdoor guys who love a great brew while watching the sunset, tending the campfire … all that good stuff. But sometimes we don’t have all the right technical terms to describe the beers we love. What are the connoisseur types telling you about Fathom IPA? James: People have really been digging Fathom IPA. We’ve heard beer enthusiasts say it has “zesty orange notes and really nice hop presence” and is “crisp, clean, and perfectly balanced.” A lot of enthusiasts have also used terms like “crushable” or “sessionable” to describe Fathom because it drinks smoothly and has a lower ABV (6%) – perfect for weekend-long camping trips or after a short hike. Our brewers describe it as an approachable IPA – less alcohol and bitterness than traditional IPAs but full flavored – making it the perfect go-to beer whether you’re curious about IPAs or a longtime craft fan. 50 Campfires: Our readers are all about beer in cans, because that’s the best way to enjoy it at the campsite. 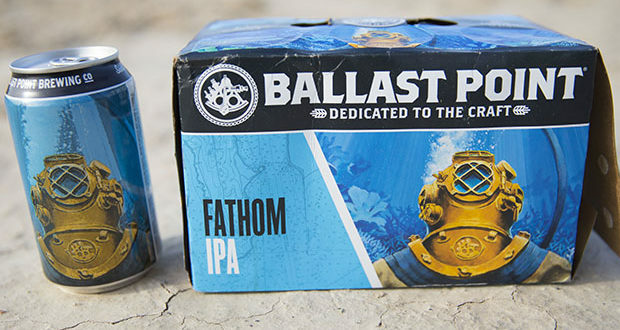 The graphics on all the Ballast Point beers are cool, but especially the images on Fathom IPA. What’s the story behind the art? James: The imagery on the can is inspired by the nautical themes found throughout Ballast Point. The art consists of a deep-sea diver submerged in water, which originates from a popular painting by our resident artist Paul Elder. The same art can be seen on the walls of our Miramar and Home Brew Mart locations in San Diego. We felt the artwork encapsulated the sense of adventure, new discovery, and depth of flavor that defines Fathom IPA. The name Fathom is also a nod to our nautical theme. The word is actually a nautical unit of length equal to six feet, which we thought was the perfect name for a beer with just the right amount of depth. 50 Campfires: We love staying on the cutting edge. Any chance you can give us a hint on what to look for next from Ballast Point? 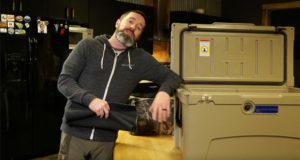 James: You’re in store for some great beers and other exciting projects! Our brewers continue to push the envelope with new styles, brewing procedures, and flavor layers that are mind-blowing. For instance, we just released our first barrel-aged package release, High West Barrel-Aged Victory at Sea, and you can expect a few more adventurous offerings in the near future. Of course, we’ll continue to release world-class IPAs and other popular styles as well. 50 Campfires: Last time we talked you were widely available in 37 states. Any changes to that? Is Fathom IPA available nationwide, too? James: Fathom IPA is available nationally in 6- and 12-pack cans. Californian beer drinkers can also enjoy Fathom IPA in bottles.